I love investigating historic locations, especially places that nearly vibrate with residual energy. 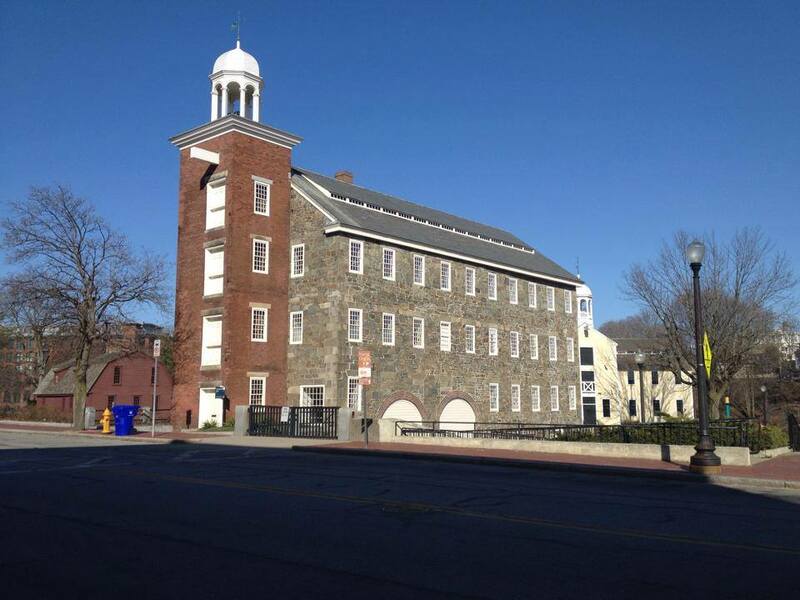 The buildings at the Slater Mill campus in Pawtucket, Rhode Island, fall soundly in this category. The minute I stepped onto the five-acre property, I could feel the layers of history piled upon one another. 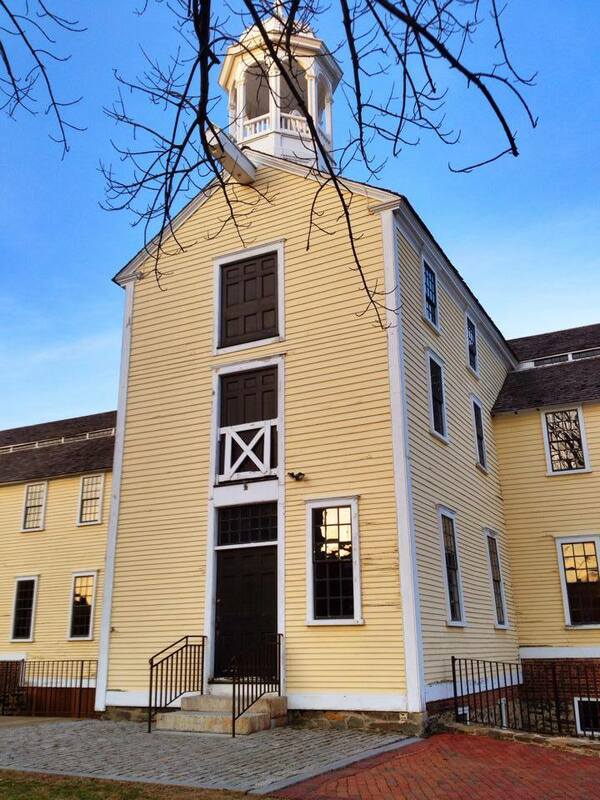 Built in 1793, Slater Mill was the brainchild of Englishman, Samuel Slater. At the age of 25, he immigrated to America and recreated the Arkwright system, which used a water-powered mill to spin cotton yarn, turning Slater Mill into the country’s first textile mill. President Andrew Jackson deemed him “The Father of American Industry.” The English call him Slater the Traitor for bringing their English ingenuity to America. The evening’s events included a tour and ghost hunt of the three buildings on the property, led by Carl Johnson, with assistance from his brother Keith. 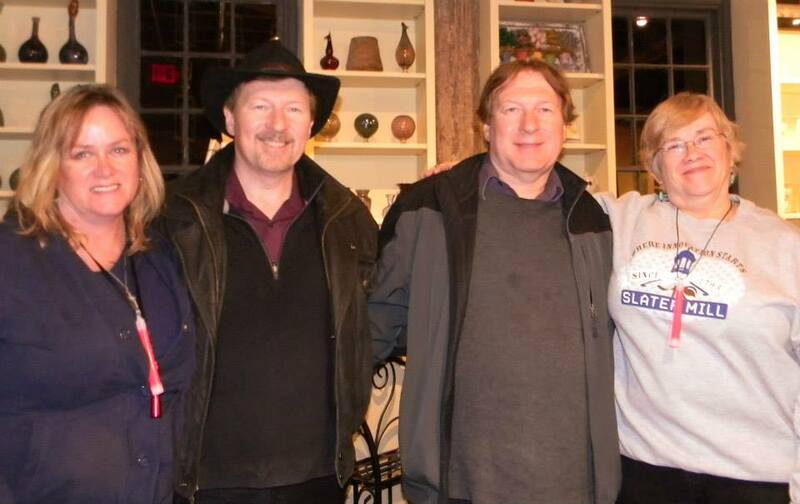 Most people recognize the brothers from their years on the hit paranormal series Ghost Hunters. Others know them from their vast contribution to the paranormal field. While their presentation of the property’s history and hauntings was educational, their personable delivery made it even more intriguing. 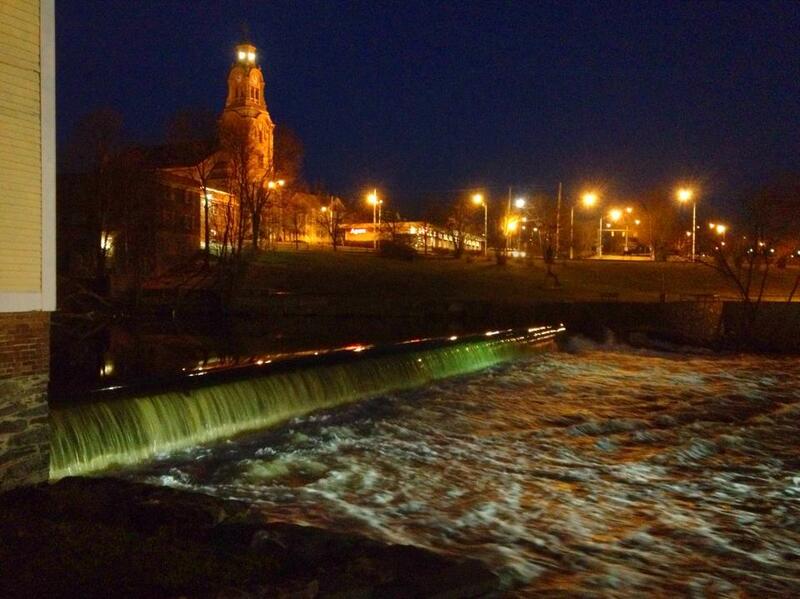 The Slater Mill building stands two stories tall, casting an ominous shadow on the raging Blackstone River behind it. Painted a sunny yellow, the architecture speaks volumes of colonial times, when purpose was more monumental than appearance, especially for a mill that was first of its kind in our country. Stepping inside the building is like time traveling to another era. Thanks to the efforts of the Old Slater Mill Associate, which purchased, restored, and preserved the building back in 1921, the mill looks like it did in the 1800’s. It’s not a stretch of the imagination to visualize the machinery roaring to life and the room filling with workers bustling around the various machinery. We started our tour in this building. Being a sensitive, I immediately detected several ghosts in the building. I felt them lingering at the edges of the room, casually watching us. It almost reminded me of going to the zoo, but in this instance, we were the captive occupants being observed, instead of the other way around. It made for an interesting experience. As the group paused near the middle of the building, Carl plugged in a plasma ball, which produces a lightning-like current of electricity inside a plastic globe, to increase the energy in the room. He also turned on a black light, explaining that ghosts are often more visible in ultra-violet lighting. He then told us about the children who haunt the building. Attitudes regarding child labor were far different in the1800’s than they are today. Children were expected to work, whether it was on the family farm or in a factory environment. When Slater Mill first opened, the primary employees compris ed of entire families, including children as young as seven. They worked long hours, typically from dawn until dusk, for as little as a dollar a week in a hostile environment that was freezing during the winter and sweltering during the summer. While the machines were simple to use, accidents still happened and children were frequently injured, if not killed. The photo to the right was taken at Slater Mills during its heyday. During our tour, one of the women asked if the little boy was still there. Apparently, she took a tour years ago and saw a small boy run across the second floor. He appeared as real as a live boy. She didn’t think much of it until she realized there weren’t any children on the tour. The staff searched for the illusive boy but never found him. Had she seen a ghost? It’s highly probable. The disembodied voices of children have been heard time and time again at the mill. Carl asked if anyone would be willing to give the ghost child a hug. In the past, people who have entertained this gesture have felt the distinct sensation of a cold, tingling presence returning the hug. When no one volunteered, he asked if I would try it. I was happy to comply. At first, I was focused on the people surrounding me, watching me foolishly hug the air, but as I relaxed, I began to feel something else. 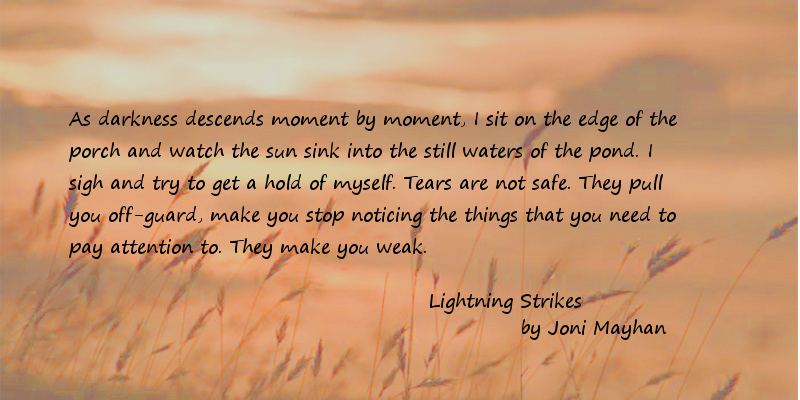 The air inside my arms grew cooler, and I began getting the sensation of pressure. I had my mouth open to tell them that I was indeed feeling something when someone put a K2 meter near me, which immediately began flashing. K2 meters record high electro-magnetic pulses, often signaling the presence of a ghost. Unfortunately for us, they can also triggered by smart phones or walkie-talkies. I’m normally diligent about turning off my phone prior to investigations, but had forgotten, resulting in the false positive response. By the time I turned my phone off, the moment was lost. A man is often seen walking through the building as well, by both staff and visitors. People frequently witness him moving through the rooms. Could this be Samuel Slater, overseeing the property that bears his name? Or is it a worker who spent time at the mill? Theories abound, but no one is certain of his identification. It’s one of the mysteries that keep investigators returning to the mill. We spent a few minutes walking around the building before moving to the next building, the Wilkinson Mill. After the success of the Slater Mill, the Wilkinson Mill was added in 1810, increasing the factory’s production and improving upon the design. Built of stone to prevent fire, which plagued Slater Mill twice in its history, the Wilkinson Mill is an impressive presence on the banks of the Blackstone River. Substantially larger than its sister mill, the Wilkinson Mill looms over the river as a testament to the once prosperous industry that dominated the area. The main floor contains a machine shop, stocked with many of the machines used during the era. 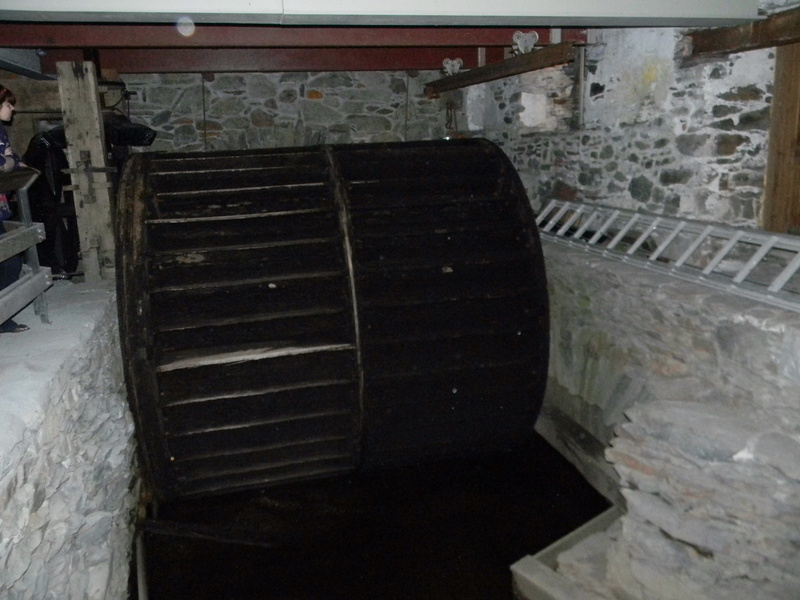 We were treated to a tour of the basement, where the massive ten-ton waterwheel is located. The room is cavernous, with sounds echoing freely around the granite walls and water pool. Since stone and water are known to absorb energy, It wasn’t difficult to imagine the spirits drifting among us. The ghost of a small boy is often seen here, as well as a mysterious shadow person. During the tour, Carl invited several people to experience the area at the base of the stone stairs, where the shadow person is often seen. I offered to accompany two groups. As I descended the stairs, I could feel a heaviness in the air. The young women who went with me also felt it, one of them claiming to see the shadow of a person. Using my digital recorder, I invited them to ask questions of the entity, but no responses were captured. If you stare at the windows of the Sylvanus Brown house long enough, you might find a small face in an upstairs window staring back at you. This happened to several observers years ago. Upon notification, the caretakers of the property searched the building, finding the door firmly locked and the building vacant. Being the smallest building on the property, it was the also the most fascinating for my friend Sandy and me. We immediately felt the presence of several ghostly inhabitants. While we both felt there was a male and a female entity, Sandy also thought there was a female child in residence. Little did we know how accurate we were. Investigators over the years have determined that the property is haunted by a woman, a man, and a girl, reportedly named Becca. The Brown House, which is the second oldest house in Pawtucket, was built in another area of town, but was relocated to its current location when the highway project threatened its existence. 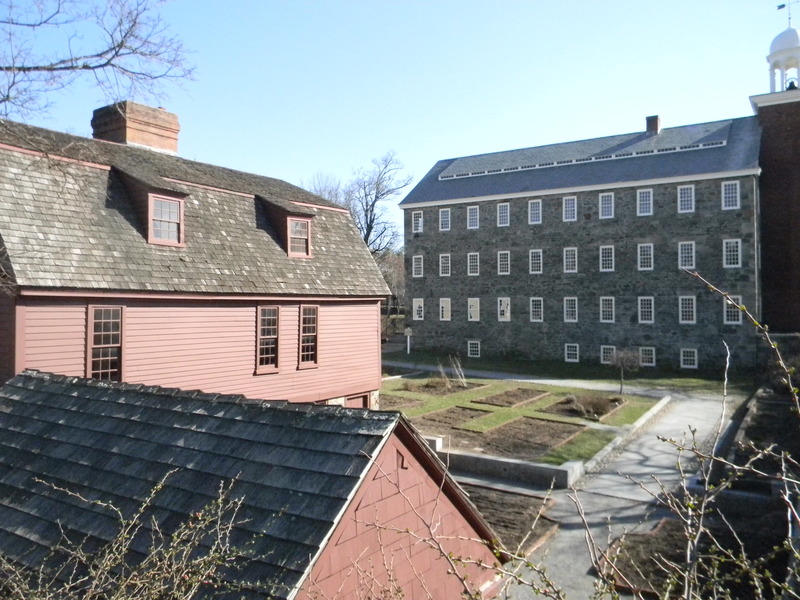 Since Samuel Slater was a guest at the Brown house during his first few days in Rhode Island, moving the house to the Slater Mill property was a logical choice. The parlor room had a peaceful feeling to it, which is no surprise since it was a room typically used for happy events, like entertaining guests, celebrations, and weddings. Befitting the period, it was probably also used for funerals and wakes, lending it a slight sense of sorrow. After playing haunting music on a music box, to pull Becca into the room, Carl demonstrated the use of dowsing rods. Several of the guests experienced responses to their questions and were delighted with the results. The evening quickly ended and the property was left to itself once more. As we drove away, I could almost imagine the ghosts drifting to the windows to watch us leave, entertained by our foolish endeavors. While I didn’t experience any paranormal phenomena or capture any evidence on my audio recorder, I found the three-building location resonating with history as well as a sense of intrigue. I plan to return at some point and rent the facility for a private investigation to uncover more of the property’s hidden past. This entry was posted in Night Thoughts, Paranormal and tagged Carl Johnson, ghost hunting, Historical haunts, Joni Mayhan, Keith Johnson, New England Haunted Locations, Paranormal, paranormal investigations, Pawtucket, Sandy MacLeod, Slater Mill, Sylvanus Brown House, Wilkinson Mill by jonimayhan. Bookmark the permalink. But you DID have a paranormal experience in the hug. I know it’s rough when we get these experiences because they are not physically recorded, but you know it happened… and that’s what’s important! Great read! Can’t wait to visit with the next tour!